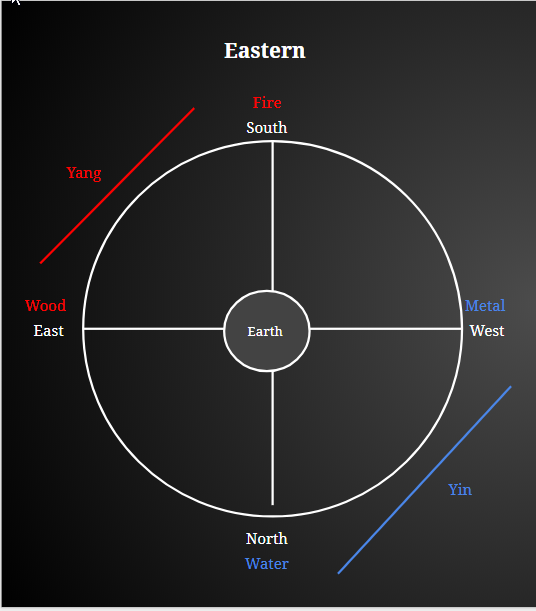 Part of the elegance of Chinese Medicine is that everything falls into a category: yin versus yang, interior versus exterior, heat versus cold, etc. The energies of all things on earth are born in spring, grow in summer, yield in autumn and hide in winter, they are all promoted by the law of variation of Yin and Yang energies of the four seasons. But you’ll hear many acupuncturists talk about a fifth season – late summer – which, theoretically we are in right now. But it isn’t until Chapter 4 of the Nei Jing Su Wen that we see a mention of this fifth season. Once again the centrality of Earth energy is mentioned and the fifth season isn’t associated with a wind disease and isn’t mentioned again for a couple of paragraphs. Then, Chapter 5 returns to talking about the four seasons. But then talks about five. You see, the Nei Jing wasn’t written by one author. It was written over the course of 600 years seeing the birth and death of many emperors and as a result, many regime changes. 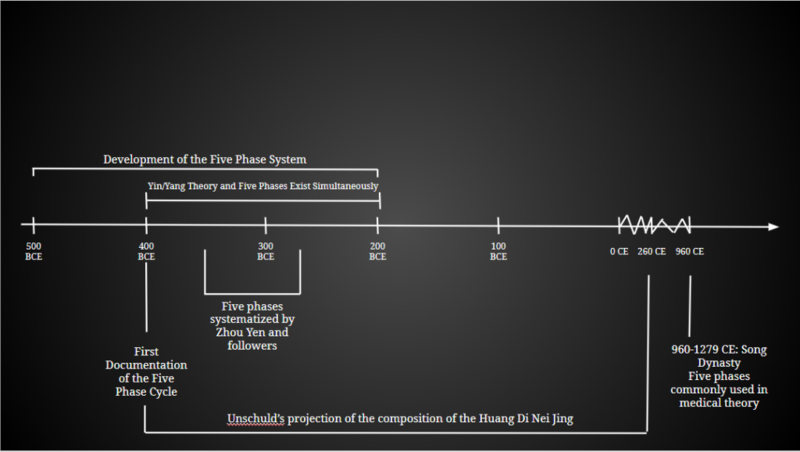 The development of the 5 Phase System or the 5 element theory took 300 years, overlapping the writing of the Nei Jing by a relatively measly 200 years. 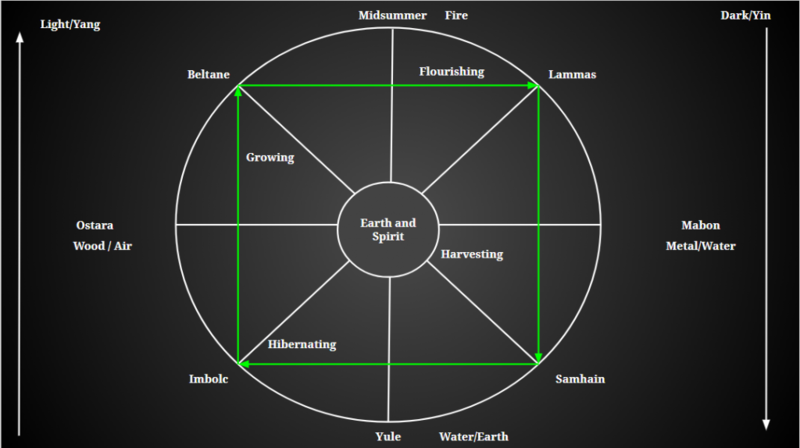 The 5 Phase system as we know it today has every element on the outer ring of the diagram. Wood (spring) leads to fire (summer) and to earth (late summer) and so on. This is the “generation” cycle and is denoted by the green arrow. But this method wasn’t commonly used until the Song Dynasty – 960 – 1279. Earth still exists as an element in this season, and as such we need to address it when living seasonally. 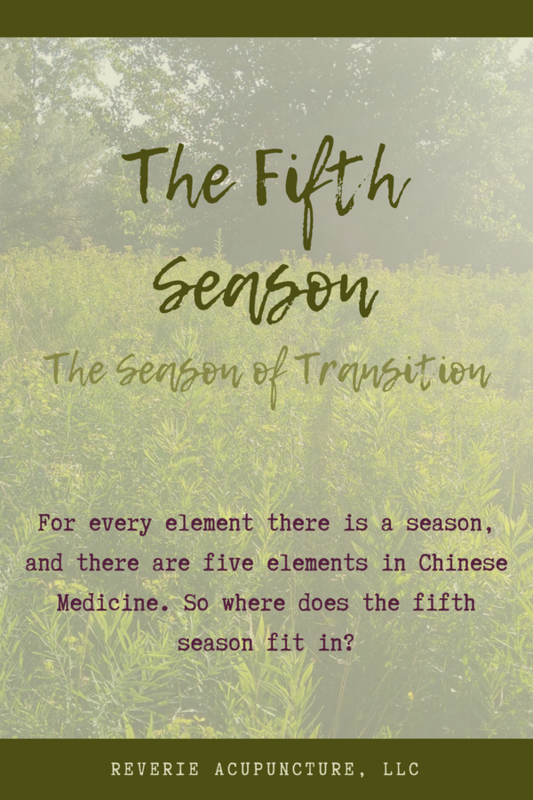 But if each season is three months and there are four seasons, how do you practice living in the fifth season? Earth is about returning to your center. And you fall back to your center in the yin of the season – the end. “The Spleen belongs to Earth which pertains to the Center, its influence manifests for 18 days at the end of each of the four seasons and it does not pertain to any season on its own”. These last 18 days are similar the yin moon phases, or the yin months but instead of being yin in the ways Metal and Water are about rest and nourishment, these 18 days are about returning to your core. And you return to your center every season. The Ancient Europeans had a fifth season too – Spirit. And the correlating element for direction and meaning in Chinese Medicine? Earth. 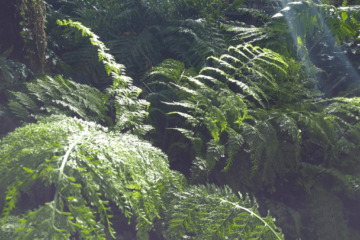 Centering yourself seasonally is about coming back to your spirit. How beautiful is that? So what the Yellow Emperor is saying is that without Earth, the other elements wouldn’t prosper. 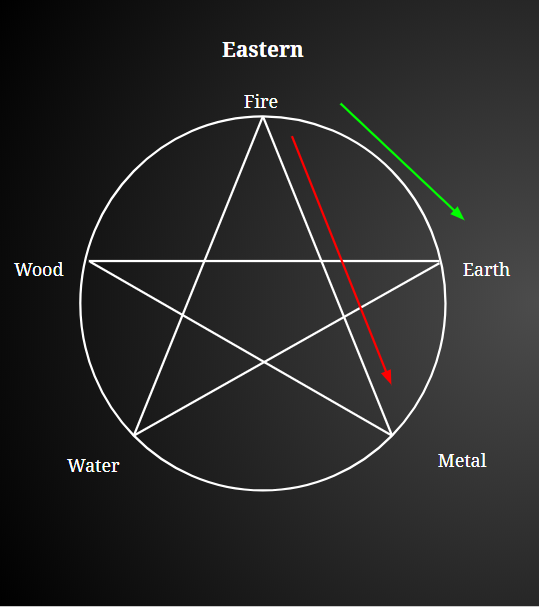 In Ancient European traditions we see this too – Spirit is held above all other elements because without Spirit none of the the other elements would exist. What it really boils down to is that Spirit and Earth are about transition – the transition of a basic energy or substance into one of the other elements. So this season is about gracefully accepting change. Remember to eat in moderation – the fifth season is about harmony and centrality. Extreme dieting or feasting can upset our digestive system at a time we are giving it a chance to restore. Whatever helps you find your center and come more into yourself, do that. That may be journaling or meditation. Or it might be more active yoga or qi gong. I have some patients who find their happy place by going running. So long as you’re doing it mindfully and it brings you back to yourself, do more of that. A note of caution on more vigorous centering exercises, this isn’t a time to push yourself for personal records. This is the season of moderation. One simple method to literally find your center is to practice belly breathing. Sit or lie down and rest one hand on your belly and one hand on your chest. Spend some time intentionally and mindfully breathing. Your goal is that on your inspiration your belly hand will lift before the hand on your chest. And on your exhalation your chest hand will fall before your belly hand. Once you fall into the right rhythm, keep breathing like this for a few moments. This is the time to find ways to get your hands in the dirt. 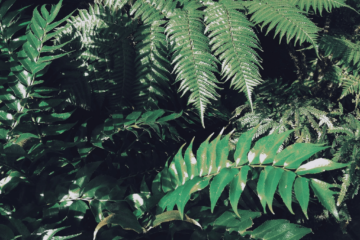 While this may be difficult in the dead of winter, you could always consider a potted plant to add some life to your home (and naturally purify your air!). You can take this one step further and grow your own food! The Spleen/Stomach systems are about how we process what we take in and, ultimately, the waste we produce because of it. Use this time to be mindful of what you take into your life – mentally, physically, spiritually and emotionally – and determine if you really need it. 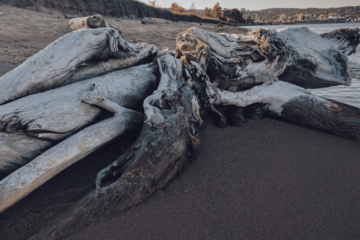 And if you find yourself taking in something you don’t need or producing things that impact the world around you negatively, make some plans on how you can reduce that impact. While a lot of living seasonally is about nurturing yourself, this time is a perfect time for you to mindfully nurture others. Take a sick friend some food, volunteer at a food bank or shelter, help someone else in need. Imagine if everybody took 18 days a season (72 days a year!) to mindfully nurture the world around them. The fifth season is a time to look at your habits and routines. Is there something you can add that would make your life easier or healthier? Is there something you do that doesn’t serve you anymore? Mindfully work with improving your life’s rhythms. 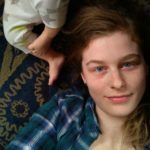 You’ll notice that this blog post was written on the second to last day of the summer transition. It was somewhat intentional because these next few weeks are what are commonly considered the “long summer” and therefore the fifth season. But Wednesday, August 1st is the beginning of autumn and we’re going to be turning ourselves towards relaxing into winter. Without the appropriate three months to prepare, winter can be hard. And if we’re spending a few weeks focusing on a transition at the wrong time of year we are out of rhythm with nature. Even though this is being posted at the “wrong time” it will always be here for you to look back at through the magic of the internet. And keep an eye out for the next post on living seasonally so we can prepare ourselves for winter.